Chicken Milanese is a quite versatile way of cooking chicken breasts. You can have it with pasta, some nice gravy or why not have it with... Tell you what, let's save that one for another day. 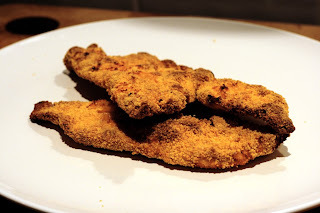 I'll post a recipe where I use Chicken Milanese in a day or two. I choose to oven bake this version to keep it a bit healthier. If you want to, you can always pan fry it instead. If you want to go half and half you can start by pan frying it and then finishing off in the oven. In the meantime, put the chicken halves between clingfilm and bash them with a mallet until the are about 3 - 5 mm thick. On one plate mix the flour, paprika, parmesan, salt and pepper. Beat the egg in a deep plate and finally put the breadcrumbs onto a third plate. Coat the chicken pieces thoroughly with the flour mixture. Dip in the egg and finish off with a thorough coating of breadcrumbs. Put the chicken pieces on a oventray and put into the oven for 30 - 35 minutes or until cooked. Flip them half way through the cooking time.